Mangrove wetlands are one of the most threatened ecosystems in coastal zones, and are being degraded globally at a high rate due to human activities. Impoverished and vulnerable populations living in rural coastal areas in subtropical and tropical latitudes tend to be most directly dependent on ecosystem services and hence are directly affected by the degradation of mangrove wetlands and other coastal resources. We formed an interdisciplinary and international team of researchers, students, and professionals to understand the linkages between poverty traps and mangrove ecosystem services in coastal Tanzania, thus informing and contributing to institutional efforts to resolve and avoid these traps. 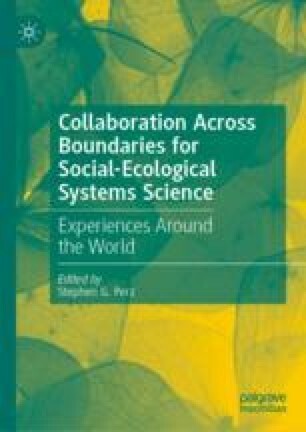 This chapter analyzes the nature of this coupled natural-human system, assesses the challenges to implement an interdisciplinary research agenda as a team, and underscores the practical strategies to overcome those challenges. Research reported in this chapter was supported by the National Science Foundation Coupled Nature and Human Systems Program #1518471. E. Uchida acknowledges additional funding support from the URI Coastal Institute, URI Undergraduate Research Grant and URI Research Completion Grant. Partial funding to Rivera-Monroy was also provided by Department of the Interior South Central Climate Science Center through Cooperative Agreement #G12AC00002 and the National Science Foundation Long-Term Ecological Research program (Grants DEB-9910514 and 1237517 and DBI-0620409). We thank the following individuals and organizations for exceptional research assistance: Thomas Blanchard, Pamela Booth, Juma Dyegula, Zahrie Ernst, Ezra Katete, Megan Kelsall, Jamillah Kileo, Sarah Martin, Timothy Piacienni, Gumbo Majubwa, Rose Malyaga, T. Mkongo, Shafii Mohamedi, Humphrey Tillya, Mattana Wongsirikajorn, all enumerators and Sea Sense staff. Ajonina, G., Diame, A., & Kairo, J. (2008). Current Status and Conservation of Mangroves in Africa: An Overview. World Rainforest Movement Bulletin, 133. https://wrm.org.uy/articles-from-the-wrm-bulletin/current-status-and-conservation-of-mangroves-in-africa-an-overview/. Mcleod, E., Chmura, G. L., Bouillon, S., Salm, R., Bjork, M., Duarte, C. M., et al. (2011). A Blueprint for Blue Carbon: Toward an Improved Understanding of the Role of Vegetated Coastal Habitats in Sequestering CO2. Frontiers in Ecology and the Environment. https://doi.org/10.1890/110004. Saenger, P., Gartside, D., & Funge-Smith, S. (2013). A Review of Mangrove and Seagrass Ecosystems and Their Linkage to Fisheries and Fisheries Management. School of Environment, Science and Engineering Papers. http://epubs.scu.edu.au/esm_pubs/2239/. World Bank. (2015). Tanzania—Mainland Poverty Assessment (Vol. 2): Main report (English). Washington, DC: World Bank Group. http://documents.worldbank.org/curated/en/530601468179976437/Main-report.